"79th Aero Squadron" redirects here. For the 79th Aero Squadron of 1917, see 491st Bombardment Squadron. The 79th Fighter Squadron is part of the 20th Fighter Wing at Shaw Air Force Base, South Carolina. It operates the General Dynamics F-16 Fighting Falcon aircraft conducting air superiority missions. The squadron is one of the oldest in the United States Air Force, its origins dating to 22 February 1918, being organized at Rich Field, Waco Texas, as a pilot training Squadron during World War I. The squadron saw combat during World War II, and became part of the United States Air Forces in Europe (USAFE) during the Cold War. The 79th Fighter Squadron traces its history back to February 1918, when it was first organized as the 79th Aero Squadron. The unit inactivated from November 1918 until April 1933, when it became the 79th Pursuit Squadron, flying the Boeing P-12 at Barksdale Field, Louisiana From 1940 to 1942, the squadron trained combat pilots and flew the Curtiss P-40 Warhawk from bases on the east coast. Lockheed P-38J Lightning of the 79th Fighter Squadron. 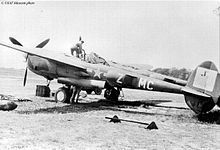 In 1943, the 79th converted to the Lockheed P-38 Lightning, flying out of Northamptonshire, England, performing duty as bomber escorts and conducting fighter sweeps over Germany. The 79th remained at English bases throughout the war, supporting both the Normandy invasion and the allied drive into Germany. The squadron returned to the states and was inactivated on 19 October 1945. The 79th was again brought to active service on 29 July 1946, at Biggs Field, Texas. The unit moved to Shaw Field, South Carolina, in October 1946. The squadron moved again to Langley Air Force Base, Virginia, in November 1951. In June 1952, the squadron began to train to support NATO ground forces in conventional and nuclear roles arriving at RAF Woodbridge, England 1 October 1952 flying first the F-84G Thunderjet and then in 1955 the swept wing F-84F Thunderstreak. Redesignated as the 79th Tactical Fighter Squadron the unit transitioned onto the North American F-100 Super Sabre in 1957 and shared RAF Woodbridge with the 78th Tactical Fighter Squadron of the 81st Tactical Fighter Wing and operated locally under the command of the 81st Wing which was based at nearby RAF Bentwaters. The next change came in 1970, when the squadron transitioned to the General Dynamics F-111 Aardvark and moved to RAF Upper Heyford, England. The 79th received the Commander in Chief’s Trophy in 1981, as the best tactical fighter squadron in U.S. Air Forces in Europe. From 1990 to 1991, the 79th deployed to Southwest Asia to support Operations Desert Shield and Desert Storm. On 30 June 1993 the squadron inactivated. On 1 January 1994, it was reactivated at Shaw Air Force Base, South Carolina, transitioning to the General Dynamics F-16 Fighting Falcon and assuming the mission of suppression of enemy air defenses. Since that time, the 79th has continuously supported Operations Northern and Southern Watch in Southwest Asia. In December 1998, the 79th took an active part in Operation Desert Fox in conjunction with Operation Southern Watch demands. The squadron flew more than 1,000 successful combat sorties with these dual operational requirements. In January 1999, the 79th Fighter Squadron was awarded the South Carolina Air Force Association’s Outstanding Air Force Unit of the Year award. Also in 1999, the squadron was honored with Air Combat Command’s Maintenance Effectiveness Award. In June 1999, the 79th deployed F-16CJs in support of Operation Allied Force to a bare base in Southwest Asia. Squadrons either stood down on a rotating basis or kept combat ready or at a reduced readiness level called “basic mission capable” for part or all of the remaining months in fiscal 2013. This affected the 79th Fighter Squadron with a reduction of its flying hours, placing it into a basic mission capable status from 5 April-30 July, then returning it to combat mission ready through September 2013. Activated on 1 January 1994. ^ Aircraft is General Dynamics F-16C Block 50 Fighting Falcon serial 94-49. Taken in 2002. ^ Aircraft is General Dynamics F-16C Block 50P serial 92-3923, taken on 11 August 2001. ^ This squadron is not related to the 79th Aero Squadron organized on 15 August 1917 at Kelly Field, Texas and redesignated 491st Aero Squadron on 1 February 1918. ^ If location at Waco, Texas was Rich Field, probably assigned to Post Headquarters, Rich Field, then after move to Hicks, Texas to Post Headquarters, Talliaferro Field. ^ Aircraft operated in 1918, particularly the S-4, are not certain. Robertson. ^ a b c d e f g Robertson, Patsy (February 25, 2008). "Factsheet 79 Fighter Squadron (ACC)". Air Force Historical Research Agency. Retrieved October 2, 2017. ^ a b c d e "Library: Fact Sheet 79th Fighter Squadron". 20th Fighter Wing Public Affairs. July 10, 2009. Archived from the original on September 26, 2015. Retrieved October 3, 2017. ^ a b c Everstein, Brian; Weisgerber, Marcus (April 8, 2013). "Reduced flying hours forces grounding of 17 USAF combat air squadrons". Military Times. Retrieved October 4, 2016. Order of Battle of the United States Land Forces in the World War. Vol. 3, Part 3 Zone of the Interior: Directory of Troops (Reprint ed.). Washington, DC: Center of Military History. 1988 . Retrieved January 22, 2017. Wikimedia Commons has media related to 79th Fighter Squadron (United States Air Force).